Kagome Higurashi, a normal 15-year-old girl, falls down a dry well--and finds herself in the feudal past, 50 years after her ancestress Kikyo imprisoned the half-human/half-demon Inu-Yasha. As the reincarnation of Kikyo, Kagome possesses a magic jewel that greatly increases the power of demons. 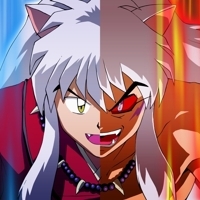 Kagome fetters Inu-Yasha with the help of her priestess-ancestor Kaede, and when the jewel is shattered Kagome and Inu-Yasha must ally to recapture the fragments. 10174 users rated Inuyasha [TV].